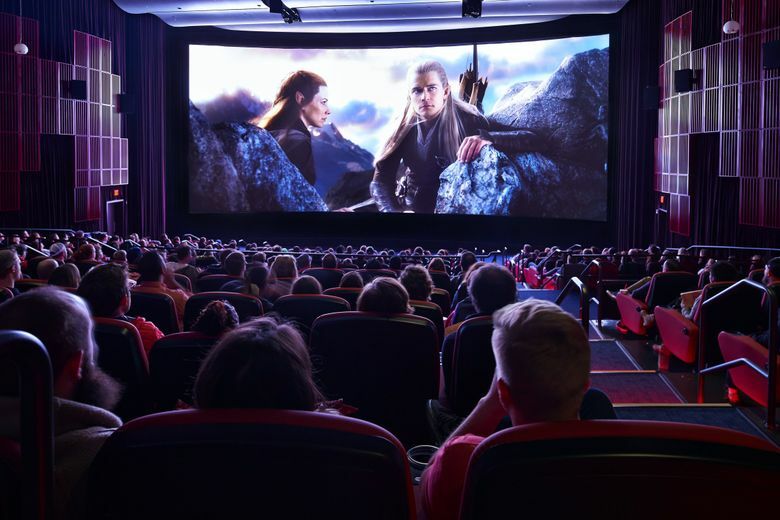 Part seven of the series finds food writer Bethany Jean Clement and movie critic Moira Macdonald at Seattle’s classic Cinerama for a screening of “Ocean’s 8” — and a major chocolate-popcorn debate. Welcome back to Dinner at a Movie, in which Seattle Times food writer Bethany Jean Clement and film critic Moira Macdonald team up to test out local theaters serving food and adult beverages. So far, they’ve been up north to Mountlake Terrace’s Cinebarre (an all-around good time), east to Redmond’s iPic Theaters (pricey, but comes with blankets! ), to Seattle’s Central District for Central Cinema (so lovable), then back east again for Bellevue’s Cinemark Reserve (blandly upscale, but best food), south to the Tin Room Bar & Theater (so charming, they both contemplated moving to Burien), and north again to the Anderson School (nice, with a couple of caveats). Now they head downtown for a Seattle classic: Cinerama. 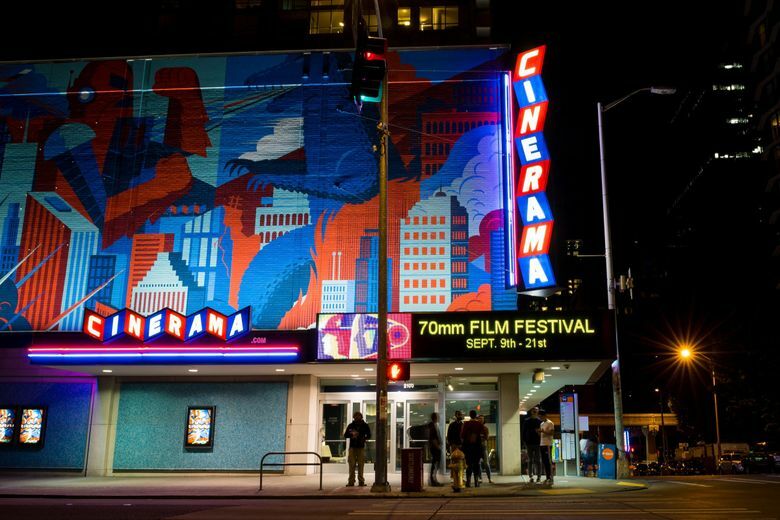 Moira: Cinerama frequently has festival programming (visit this month for the 70mm Film Festival! ), and we dropped by during Summer Rewind Week to see “Ocean’s 8.” Which I had seen and enjoyed before, but I thought the glorious outfits would look pretty great on the big screen — and that Bethany and I might have fun identifying with Sandra Bullock and Cate Blanchett. Dinner at a Movie is sort of like a heist, right? Bethany: I had not seen “Ocean’s 8,” nor did I remember anything about it except its relation to “Ocean’s Eleven,” the big, splashy, all-star-cast movie from … sometime a while back. Moira: It was 2001; my first year reviewing movies for The Seattle Times! (I might be old.) In this spinoff, Bullock plays Debbie Ocean, sister of Danny Ocean (played by an extra-smooth George Clooney in “Ocean’s Eleven”). She, like he, is a very good-looking con artist. Moira: Yes! The cast of this film — Bullock, Blanchett, Rihanna, Anne Hathaway, Helena Bonham Carter, Mindy Kaling, Sarah Paulson and Awkwafina — is SUCH good company. You just want the movie to go on a little longer so you can hang with them some more. Bethany: I absolutely loved it. You can’t even begin to decide who your favorite character is, nor which one is most like Moira. Moira: My “Ocean’s 8” alter ego is Bonham Carter’s character, an Irish fashion designer who frequently wears fanciful hats and befuddled expressions. Bethany: I want to be like the hacker, played with supreme insouciance by Rihanna, who (spoiler) opens her own pool hall at the end. She is such a badass. But they’re all such badasses. Moira: All of them are welcome to have Dinner at a Movie with us anytime! Even if they steal our wallets. Moira: So, we have on recent Dinner At a Movie outings been spoiled by lovely Caesar salads, crisp BLTs and surprisingly good movie-theater crème brûlée. Moira: And by MYSTERIOUSLY MISSING TATER TOTS. Bethany: In context, an Uli’s Famous Sausage ($8) in a very squishy white bun seems just fine. It’s maybe not dinner — more like a snack. But as Moira noted, it tasted nicely porky; it also had a pleasant, faint herbiness, like a quality breakfast link. Moira: This was my first use of the word “porky”! I want to be a food writer someday! Bethany: You are 76 percent there! We both thought the beef hot dog ($6) tasted just like a hot dog — again, with an extremely compressible white bun. I’m not sure where they’re sourcing such very squishy ones, but maybe we don’t want to know. As for the rest of the menu, a pretzel ($6) bearing the imprimatur of Tom Douglas had a good exterior chew and was probably nicely browned (the light of “Ocean’s 8” did not allow for such observations), but was doughier inside than one you’d get at his Brave Horse Tavern. Still, a fine pretzel. Moira enjoyed the extra-puffy asiago and black-pepper cheese puffs ($8) from Fuller Foods in Portland; I prefer the crunchy style, but to each their own. Moira: The puffs were sort of like a cheese version of cotton candy. Nothing wrong with that! Bethany: True. But if actual dinner is what you seek, Mamnoon Street, Marination and Eggs & Plants are all nearby, quick and more substantial than cheese-cotton-candy or a sausage on a squishy bun. Bethany: We’ve also been spoiled with all manner of cocktails at Dinner at a Movie. I’ve come to expect some variation on a Manhattan with my film, maybe called the Director, as at Central Cinema. The beverage menu at Cinerama is local beer, wine and cider only — still, you may take your drink to your seat, and that’s good enough for us … we guess. Bethany: Moira is hands down the expert in this arena. 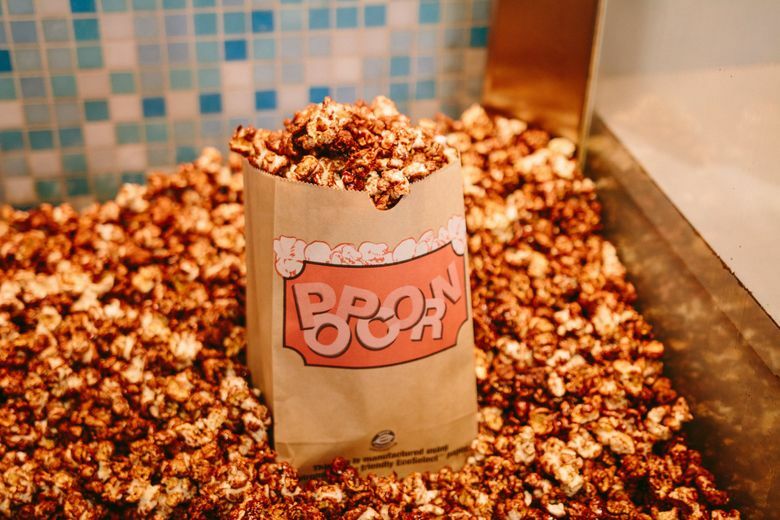 I hesitate to even opine, especially on the controversial subject of An Alternate Form of Movie Popcorn. Moira: I really, really do not want to think about how much popcorn (unbuttered! Always!) I eat in a given year. Not sure if this makes me an expert or just a working movie critic who doesn’t always have time for dinner. Bethany: I never get butter, either, and I do genuinely love movie popcorn — I will eat it until my mouth hurts. And I’d never tried Cinerama’s famous (infamous, to Moira) chocolate version. The first few handfuls made me understand why people go nuts for it: It was warm, super-crispy-candy-coated, both caramelly and chocolatey and with a lovely toasty flavor, each kernel seemingly perfectly, hugely puffed. I loved it! Could I love it?! What about beautiful regular popcorn?! Moira: You, my friend, are an anarchist. To be fair, though, that chocolate popcorn is VERY divisive. I wonder if any marriages have ended over it? But it shall not dissolve our Dinner at a Movie partnership! Bethany: It shan’t! Because after the first few handfuls, it cooled, as did my fervor. It’s just not as good when not toasty-warm in both temperature and flavor. Also, I quickly felt over-sweeted. If you can eat a whole bag of chocolate popcorn and not have to go run in circles in the lobby, then collapse in a corner, I salute your sugar tolerance. I only got through about one-eighth of it. Then I wanted regular popcorn. Moira shared. 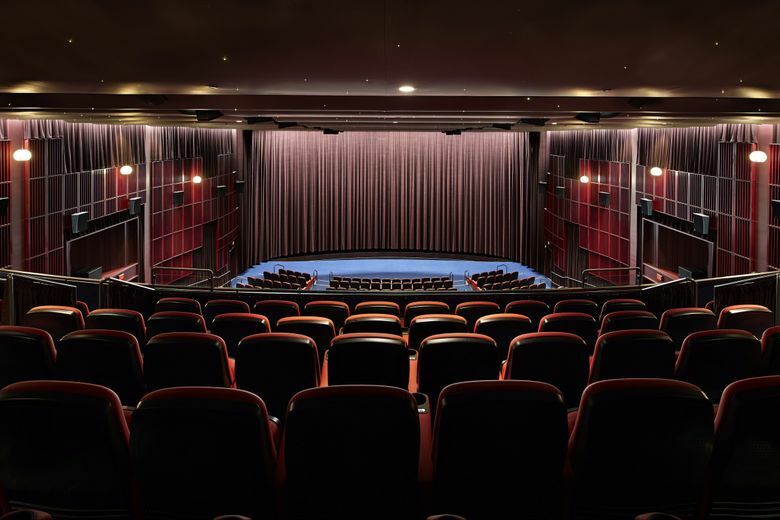 Moira: Cinerama’s most recent renovation, in 2014, brought new seats — wider than the old ones, and less bouncy — and better sight lines. We sat in the front row of the balcony and enjoyed a delightful view and plenty of legroom. Bethany: The front row of the balcony at Cinerama makes you feel like you are in the movie. It’s the best moviegoing experience I’ve ever had, hands down. After the remodel, I saw “Pina,” about German contemporary dance icon Pina Bausch, and it was practically a religious experience. And something fluffy like “Ocean’s 8” is nearly equally great — I felt as if Moira and I were there at the Met Gala, wearing incredible gowns. Moira: I want the teal one Awkwafina wore. Yes, Cinerama is basically a dream, and getting lost in its big screen is one of my favorite pastimes. I wish I could see every movie here. Moira: … trying not to think about the chocolate popcorn. I’m kidding! Cinerama, we love you.